UK high street bank Barclays is no longer listed as a shareholder in Elbit Systems, the major Israeli military company that manufactures drones used in Israel’s attacks on Palestinians and helps Israel build its illegal Apartheid wall.The news follows a high profile campaign launched after Barclays emerged as the named owner of $2.9 million worth of shares in Elbit. 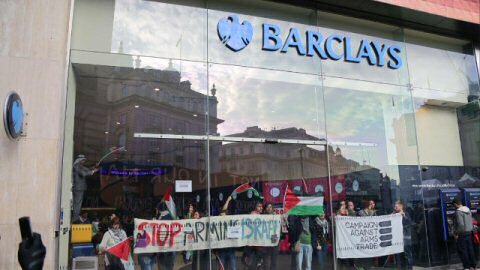 More than 1.7 million people signed a petition organised by Avaaz calling on Barclays to divest from Elbit Systems and campaigners have occupied and protested at bank branches across the UK. On November 28 last year, campaigners held occupations and protests at more than 15 Barclays branches across the UK. It recently came to light that Barclays is no longer a listed shareholder of Elbit. However, Barclays is yet to make a public commitment that it won’t own shares in Elbit in the future and still holds shares in other arms companies that supply Israel. The Barclays shareholders meeting takes place on April 23. More from the Alternative Information Center.